The Reaper Stage 1 Kit is a fast and easy way to add power and performance to your vehicle. 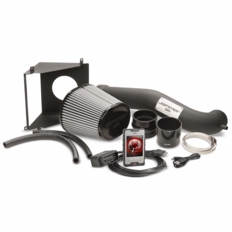 Each Reaper Stage 1 Kit includes an inTune i3 Platinum and the all-new Jammer Intake. The i3 is designed to work with the addition of the Jammer intake for each specific application and the tunes are all designed to optimize the performance of the new air intake. The Platinum inTune i3 includes pre-loaded performance tunes from DiabloSport for economy, towing and performance. Users also have the ability to load CMR custom tunes when they elect to install advanced modifications to their vehicle. The Jammer Intake included in the kit is designed specifically for each application and features a high-flow dry filter and efficient tubing to optimize power and economy potential.